Caution: This work contains mild graphic images, sexual references, and thematic elements. I would give it a PG rating. The immortalized Incan girl that was the inspiration for Nakomai. 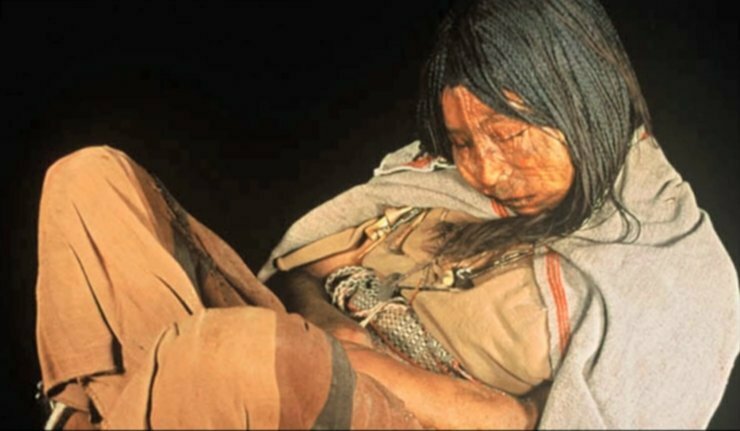 In April of 1999, high in the Andes where thaws never come, a team of archeologists discovered the frozen Inca mummy of a teen-aged female child sacrificed to their pagan gods, preserved and immortalized for a future age’s discovery and philosophizing. Poignant. Repulsive. Sickening. But wait! Don’t turn away! Look full into her face. See the skin tightly drawn and slightly shriveled from five centuries of waiting to be found, an expectant expression still intact. The cold fluorescent moon glinted off the icy black eyes of a primitive mother as she watched her only daughter, Nakomai, ascend the rough-hewn wooden ramp up to the stone altar. Their gaze met, and she could see in her daughter’s eyes a mixture of apprehension and expectancy. Even though it was summer, at this altitude it was still below freezing, and she shivered, both from the cold and from the events that were about to transpire. A pagan priest dressed in feathered regalia welcomed the sixteen-year-old girl onto the platform and presented her with a crude stone cup. From the kettle on a nearby fire pit, he ladled a portion of a primitive herbal narcotic, steam pouring forth voluminously into the cold air. Even from a stone’s throw away, the pungent aroma stung the mother’s nose. Watching her only daughter drink the potion, the mother battled against the tears trying to force their way onto her cheeks. But she lost. She couldn’t prevent them from gathering on the surface of her eyes, providing the perfect aqueous canvas for the moon to paint the anguished picture of her heart. Why was her heart aching so much? It wasn’t supposed to be feeling so heavy. All her friends were excited for her. They were almost envious that her daughter was the “Chosen One.” Nakomai had incredibly pleased the priest in her “conjugal evaluation,” so surely Viracocha, their Earth God, would be so pleased with his new bride that he would bless them with good harvests for the next twenty seasons. He only requires a new wife every twenty years, so Nakomai is in an elite group. “It is Nakomai’s destiny to be the wife of a god, and it is your destiny to be the honored mother-in-law of deity,” her aunt had told her. This was an honor? It didn’t feel like it. She felt like a dead fish floating on the surface of lies and half-truths. She looked back to the altar platform where Nakomai began to act giddy with euphoric delight as the concoction, brewed from sacred coca leaves, worked it’s mind-altering effects. Her daughter was so beautiful — such a beautiful laugh, such beautiful eyes. She admired the silver-edged blue feathers laced throughout her hair. She had personally strung the long necklace of small pink spondylus shells that hung from her neck, looping down amongst the ornate feathers decorating her bridal tunic. The ankle-length drab-pink skirt she wore had swished captivatingly as she walked up the ramp. Oh, she had been such an early walker. Why did her last walk have to be the walk of death? But her friends and relatives have told her this is the way it is to be. The priest had spent a considerable amount of time teaching her The Doctrine of Viracocha. She now looked to the left of the altar at all of the jewels, grain, gold, precious shells, and expensive fabrics that were to be hers and her husband’s. The priest had been right. Viracocha did pay an extravagant dowry for his brides. Her family would never be poor again. They would never lack for food again. She would always be dressed in the finest fabrics her people had. She would be looked upon as a sage, greatly revered and respected in the village. Her people would always be grateful to her. So she suppressed her motherly instincts. With many of the others dancing along, she watched as Nakomai danced the marriage dance, promising herself to Viracocha in the afterlife. It was one of the most beautiful dances she had ever seen Nakomai perform. Dancing was one of Nakomai’s greatest loves, even as a toddler, dancing almost as soon as she had started walking. Now she was dancing her last dance on this earth, the dance of a deified bride giving herself to a god in necro-marriage. So the mother tried to ignore the pain inside and watched as the ritual proceeded, resigning herself to the cultural paradigm she was presented with. To squelch the torment in her heart, she joined in with festivities. The drumbeats grew louder and louder as the people, dressed in bright colorful feathers and leaves, danced more furiously and furiously. Nakomai laughed harder and harder as the drug took hold of her mind. Ceremoniously brandishing a large knife, the priest took her wrists and slit them. Nakomai oohed and giggled as she watched the priest collect the blood flowing dark red into a cup. Slowly, as she begin to wane, her attitude become more and more quiet; the drums grew quieter and quieter as Nakomai’s strength ebbed from her body. She slowly lay back upon the altar, yielding herself up to her new husband, expectantly waiting through the drug-induced stupor for her immortality to soon begin. And then they were silent. As her eyes closed for the last time, never to reopen to the light of life, the priest mixed her blood with wine in a kettle. Solemnly he and the elders of the village drank a long draught of the morbid mixture, sealing the blood covenant with the Earth God and his new bride. A dark silence pressed down upon the people as they realized the marriage had been consummated. Nakomai was gone. She was now in the arms of Viracocha. Then, as if on cue, a unified shout begin to rise from them, steadily growing in intensity. A shout of congratulations to their Earth God on his marriage. A shout of thanksgiving for blessings on their harvests and herds for the next twenty seasons. A shout of respect and gratitude for the strength, fortitude and unselfishness of Nakomai. Reverently, the elders sprinkled a special dust over Nakomai, preparing her for the long processional to the frozen crypt at the top of the mountain where she would be laid to rest. The priest beckoned them to the altar. Nakomai’s father poignantly placed his ceremonial tunic around her shoulders, placing a final kiss goodbye on her lifeless cheek. He ran his finger along the embroidered chain symbol bordering the hem and pulled it tight around her body. Nakomai’s mother placed sacred coca leaves under her nose. They stepped back and, as the priests began wrapping Nakomai in an intricately decorated burial cloth, a realization hit the mother — the torment in her heart had vanished. The cultural indoctrination from her people had succeeded. The tears no longer threatened to fall. She had accepted her fate. The priest holding the shroud paused for a moment, a final sign of honor and respect for both mother and daughter. The mother reached out, slowly stroked the braided hair, lovingly stroked Nakomai’s face one last time, murmured her final goodbye… and turned to leave. Are you shocked by this horrific scene? Repulsed by the morbid imagery? Saddened by the pathos? Good. Civilized people should be appalled at this practice. The steel blue light from the fluorescent bulb glinted off the flinty blue eyes of a modern mother as she watched her only daughter, Savannah, ascend the cold, stone stairs of the day-care center. At the top, Savannah turned and their gaze met, her 4-year-old eyes full of anxiety and distress. The mother shivered. But she wasn’t sure why. It must be the harsh transition from the summer heat to the air-conditioned cold. Why did businesses always have their thermostats set so low? It made it uncomfortably chilly to come in, and then, just when getting acclimated, it’s time to go back out into the heat and get uncomfortable all over again. Couldn’t they figure out a more balanced temperature to set it at? The wrinkled face and sucked-in grin of a lady decades beyond child-rearing age greeted Savannah at the door and offered her a piece of candy. The brightly-colored wrapper sparkled hypnotically as Savannah unwrapped it. What it lacked in volume, it made up for in its palliative qualities. Watching her only daughter resignedly chew the bribe, the mother couldn’t keep a few tears from escaping the borders of her eyes. Lucky? She didn’t feel lucky. Change is always difficult, but she hadn’t expected this change to be this hard. It seemed like more than just the pain of transition. It felt deeper. Hotter. More like something in her soul was being cauterized without an anesthetic. Through the front window of the day-care center she could see Savannah standing shyly off by herself, arms crossed protectively in front of her, hardly daring to breathe. Should she go back? Or did she just need to give Savannah a little time to adjust? Children played in small groups all around her. A cyclone of boys rolled around on the multi-colored berber roughhousing. A group of girls circled a white-plastic bistro table having a tea party with their stuffed animals. Others clustered in a corner playing a board game. “Life” maybe? She couldn’t quite tell. But Savannah stood quietly off to the side against a wall paneled with fake-looking mahogany and upholstered with an overkill of cushy, satiny, puckery wall hangings and blanketed quilt racks. Motionless, airless, soundless, she stood there like a beautiful wallflower in a field of poppies. This internal struggle was getting almost unbearable. Finally a girl with a blond ponytail walked up to her and handed her a Barbie doll. Savannah smiled a shy but grateful smile and they knelt onto the carpet. The blond girl hip-hopped her Stacy doll up to Barbie and Savannah giggled. They danced the two dolls in a silly dance and Savannah’s giggles turned into giddy laughter. The sugar must be really kicking in. Two of the boys got a little too boisterous and bumped into Savannah, knocking the doll to the ground. Savannah jumped back, then scrambled back to rescue her doll from the trampling feet. With a mere nod for an apology, the boy stood up and squared off against his playmates like a linebacker, dragged the back of his hand across his nose, then head-dived back into the fray, wiping the snot glistening on the back of his hand along the carpet as he went. Gross! What massive bug of destruction was that little boy carrying inside that little body of his. Was Savannah being exposed to some deadly unknown disease? The feelings of ambivalence towards her decision intensified. Was this really the best thing for Savanah? Her aunt definitely thought so. And she did. She did understand. She wasn’t just saying that to placate her aunt. The extra money would definitely be put to good use. The car she drove was such an old rustbucket she was ashamed to have others ride in it. Savannah’s stuff was already bulging out the walls of the tiny apartment they were in, so where in the world were they going to fit the stuff they needed for the other children they wanted to have. They didn’t want Savannah to be an only child, so they needed something bigger. And soon. The age gap between Savannah and her future siblings was already bigger than she wanted. And vacations? Seriously? How in the world, with their present level of income were they ever supposed to afford a thing as frivolous as an unnecessary trip that merely provides time to rest, relax, and try new things — no matter how educational the experiences may be. In short, she was tired of being poor, tired of not being able to provide everything her family needed. So yes, she absolutely understood. With her new job, they could afford them all. That’s why she was choosing to ignore that painful tug on the inside. If sacrificing time with Savannah was the only way they could make this work, then that’s what she would have to do, no matter how much it hurt. She’d have to try and make it up to Savannah in other ways. Surely a society that’s been around for countless generations, and those with the wisdom age brings, and those with all the university-sanctioned fancy letter after their names, surely they must know better than she what was best for her and her family. Surely it was best to resign herself, deferring to their opinions. A window-muffled scream drew her attention back to Savannah. She was crying. No, not just crying. Wailing. Unconsolably. One of the boys, tired of wrestling, had yanked the Barbie from her hands and was holding it away from her, taunting her. The worker tried to comfort Savannah while she scolded the boy, trying to get the doll back. The boy shook his head. Savannah cried harder. The worker scolded harder. After several minutes of who-knew-what kinds of threats or cajolings, it looked like the worker was getting through to the boy. His shoulders sagged and his face turned soft. He nodded slightly. Savannah’s crying turned to snufflings as he stretched the doll towards her. Teacups and teapots and dishes and silver plastic spoons and fake plastic cookies and a plastic sugar bowl and a plastic creamer and brown fluffy bears and hard plastic dolls with stringy brown hair and satiny dresses and a chintz tablecloth and flowery placemats and the arms and legs and pigtailed heads of several girls and the flashing grins and tousled hair of several boys were all jumbled together in one big heap next to an overturned white bistro table. Nearby a couple of chairs stood twisted and two more lay on their sides. The worker left Savannah by the wall and scurried over to sort out the mess. The boy’s arm lowered, the doll still enslaved in his grip, and he smirked. Savannah’s face turned blank. She dropped to her bottom, sliding down the wall to the carpet next to a faded-red juice stain. Head down, eyes downcast, hands resting limply on the soiled carpet, she had obviously resigned herself to the loss of her doll. At least she’s not crying any more. Savannah sat quietly, just sat, motionless, watching the boy, staring at the doll. Maybe she had figured out that bullies are best ignored until they get tired of teasing a non-responsive target and move on to more satisfying prey. Smart. She was starting to adapt, starting to learn how to deal with difficult situations. Good for her! The pain in her heart lessened a little. The tea party chaos was almost cleaned up, the little girls consoled, Band-Aids applied as needed, the smiles starting to return. The boys were done wrestling. Now they looked like they were telling jokes to each other, whispering, and then laughing. After all the excitement, a more peaceful atmosphere of fun was starting to emerge among the children. Savannah was still quiet. Not playing. Not crying. Just sitting. Like a comatose statue. The other kids were laughing and smiling around her, but still she sat, stiff, silent, and unmoving. At least she isn’t crying. The worker noticed Savannah still on the floor and went to a nearby quilt rack. She pulled an afghan off it. A gray one. A pale, lifeless gray. And so huge it almost completely entombed Savannah when she wrapped her in it. With just her placid, expressionless face peeking from the folds of the shroud, she looked so peaceful, so at rest. Finally. The pain inside turned into a dull, almost imperceptible ache. It looked like her aunt and her friends were right. Maybe this was for the best. Maybe she was adapting, learning. With one last glance at Savannah, she sniffed a final sniff, her eyes lovingly stroking Savannah’s face, swallowed hard… and turned to leave. Different women, different eras, different circumstances. Both ancient and modern societies have promoted child sacrifice. Only the trappings and ceremonies are different. The roughly hewn wood steps to the sacrificial altar become the stone steps of the daycare center. The pagan god of Viracocha becomes the American god of Materialism. The medicinal potion of the ancients to dull the pain becomes a brightly wrapped piece of candy to palliate the fear. The metal knife on the wrist killing the body becomes an emotional knife in the heart killing the soul. What can a mother — and a father — realistically do to prevent a child from feeling sacrificed, yet still balance the dialectics of modern life? It is possible. I know it is. I’ve done it. It is my hope that this essay spurs parents to such honest and objective introspection that altar ropes will be cut, children will be rescued, and families will be strengthened. Oh dear parents! I beseech you to more fully nurture and enjoy those relationships you have with your children before the fleeting moments of their childhood have breezed by. Wrap those altar ropes around that career, new or advancing, and put in on hold for awhile — something better will come along when the time is right, when there is no possibility of neglect in any form to your children. Park that luxurious new car on the sacrificial ramp and buy an older and plainer one — it may not be as glamorous but it will still get the job done. Wrap overcommitment to church in a burial cloth — it will be resurrected when it can be kept in the proper balance without succumbing to a mistaken sense of duty or responsibility. Take the sacrificial knife to your extravagant lifestyle and trim it to fit your current income — let growth come naturally. Whatever it takes, my friend, find something other than your children to put on that altar and sacrifice it instead. Make those children absolutely, undeniably, and uncategorically the first, foremost, and highest priority in your God-given responsibilities. Listen to your heart, honestly and objectively. I am confident that you will make the right decision, the one that truly is best for you and your family. But please. Do it now. Before any more of our children reach the top of the ramp. For a well-balanced treatise of the stay-at-home-moms versus working-moms controversy, I reblogged a post from Adventures of a Busy Mom called “Stay at Home Moms vs Working Moms (why we need to stop the mommy wars)“. Be sure to check out her post. My story is a little too heavy on the bias I felt in my younger parenting years instead of presenting the better balance I grew into in later years. Lacy picks up my slack. Nakomai made immortally pretty for the philosophizing and learning of the ages. All images are From the article “Frozen Inca Mummy Goes On Display” in National Geographic. 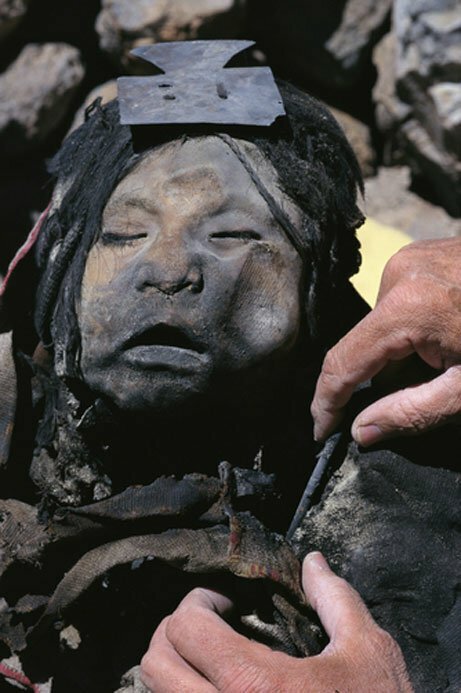 “Mummies of Inca Children Unearthed”. The Washington Post article about the discovery that inspired this essay. “Inca Child Sacrifice Victims Were Drugged”. Check out “How a Lunchbox Changed My Day” from Adventures of a Busy Mom for one creative idea on how to find a way to spend time with your child. There is also an introductory post to this piece called “Intro to Nakomai’s Immortality” if you’re interested. This work is entirely fictionalized with only a loose connection to limited research. It is not intended to be an accurate portrayal of the Incan civilization nor have any resemblance to any real person or event in the modern age. Thanks for reading. Please be sure to like, comment, share, and, if you haven’t already, subscribe or follow. Any of those quick, simple, and small acts of kindness are phenomenally powerful and help me more than you can imagine. I also invite you to check out what I think of as my best work on “My BYOB List (My Personal Favorites)”. An interesting parallel. I applaud all the research you did on the inca mummy. A truly horrific practice. I remember reading about all the infant skeletons they found at the bottom of the Roman bathhouses. I’m sure somebody in the future will read about our history and be horrified as well. Thx! And you’re probably right. Sounds like a good idea for an episode in a time-travel sci-fi show! I hear you. I homeschool my kids. It is a big sacrifice. I applaud you. We also homeschooled our kids, all the way through. It was difficult at times, but intensely rewarding and fun for the most part. And something we have never regretted doing. Keep up the great mom-work! That’s great. Always good to hear stories where it turned out well. Finally got to sit down and read this through. You are a phenomenal writer. I really liked the way you compared the two. I can tell you did research and this took a lot of heart to write! Great piece! Thank you so much for taking the time to read it, I know it was long one. I’m glad you liked it. It did take a little more courage than usual to post this one — I didn’t know how it would be received. I was afraid I might come across as judgmental or arrogant.But the message is one that I am passionate about, so Nakomai refused to leave me alone — she kept whispering in my head, pestering me and pestering me until I finally gave in to her pleadings and sent her out into the world to deliver her message. You delivered it very well! Thanks for the assurance. That means a lot to me and helps take away a lot of the apprehension. You are such an encouragement to me!